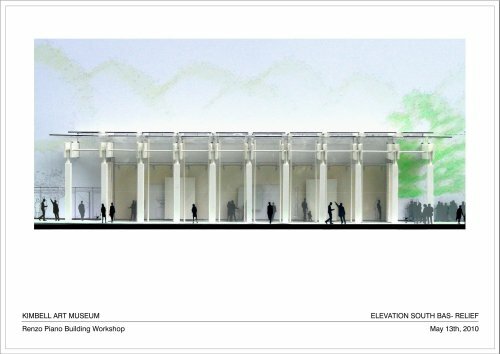 The Kimbell Art Museum unveils the final design by Renzo Piano Building Workshop (RPBW) for a major new museum building located to the west of its existing building, a landmark of modern architecture designed by Louis I. Kahn. Slated to open in 2013, the new building provides much-needed space for the Kimbell, whose exhibition and education programs have grown far beyond those envisaged when the Kahn building opened in 1972. During the major exhibitions that the Kimbell presents on a regular basis, the gallery space available for the display of its world-renowned permanent collection has been severely restricted; for periods each year, much of the collection has had to be kept in storage. The main purpose of the new building is to provide extra galleries to be used primarily for exhibitions, allowing the Kahn building to be devoted to the permanent collection. The new building also provides the classrooms and studios that are essential to a full-scale museum education department, as well as an auditorium considerably larger than the one in the Kahn building, an expanded library, and generous underground parking. Piano’s new building acknowledges its older companion in its respectful scale and general plan while at the same time asserting its own more open, transparent character. It is physically quite separate from the Kahn building, at what Piano calls “the right distance for a conversation, not too close and not too far away.” The area between the two buildings will be largely occupied by a shallow pool (flanked by pathways), which will provide reflections of the facades and nearby trees and serve as a focal point in the landscape and a pleasant, cooler transition for visitors walking from one facility to the other. The new building consists of two connected structures, the first and more prominent a pavilion that faces and to some degree mirrors the Kahn building. Here, on a tripartite facade, robust concrete walls flank a recessed entrance bay of glass. The pavilion houses a large lobby in the center, with café, exhibition store, and coat-check, and exhibition galleries to either side, all naturally lit from an elaborately engineered roof. In the galleries, Renzo Piano has striven for an even more exquisite light quality than he has achieved before: his roof system incorporates aluminum louvers, glass, photovoltaic cells, wood beams, and stretched fabric scrims. The north and south walls of the pavilion are glass, with colonnades outside to support the roof, which overhangs generously for shade. On its north side (on Camp Bowie Boulevard) it houses a loading dock. Below grade is a lower level with art storage, preparatory areas, mechanical systems, a service tunnel to the Kahn building, and other back-of-house functions. Most visitors will enter the new museum campus from the underground parking, which is between the Kahn and Piano buildings, with stairs and a glass elevator to take them up to the Piano building’s entrance. Once inside the lobby, they may enter either of the galleries to the sides or go straight ahead, through a glass passageway, into the building’s second structure. In contrast to the pavilion, this rear element of the building is self-effacing from the outside, covered by a grassy roof that gives the appearance of an earthwork or archaeological site. It contains a third gallery that is not top-lit and therefore suitable for especially light-sensitive works, as well as the auditorium, library, and education center. The double-height auditorium is on axis with the entrance, and there is a view through various spaces and layers of glass from front to back—from the front door to the glass wall and lightwell behind the auditorium stage. Equally clear from the lobby of the Kahn building, this becomes the main axis of the new Kimbell Art Museum complex, emphasizing Piano’s themes of transparency and openness. The new facility will be highly energy-efficient, requiring only a fourth of the energy consumed by the Kahn building. “I see designing for energy savings as the only proper, contemporary way to build, not as an ‘add on,’ ” says Piano. In his design he has achieved important energy savings by means of 140 geothermal wells, dug 300 feet into the earth; rain and condensate water collection to supplement the city water used for flushing toilets and urinals; robust glazing systems for the curtain walls and glass roof; photo-voltaic cells; LED lights; low-velocity air supply through the wood floors; louvered and sod roofs; and light-filtering window-shade systems. The Kimbell breaks ground for the RPBW building over the summer of 2010. When completed in 2013, the new building will complement the Kahn building and add stature to the already architecturally impressive Cultural District of Fort Worth, joining Philip Johnson’s Amon Carter Museum (1961/2001), Tadao Ando’s Modern Art Museum of Fort Worth (2002), and Legorreta + Legorreta’s Fort Worth Museum of Science and History (2009). The total project cost is $125 million. “An awesome challenge” is how Piano has described the effort to complement Kahn’s masterpiece. The Kimbell’s Board of Directors believed that if any architect were up to the task, it was Renzo Piano, who worked for a time in Kahn’s office as a young man and has already designed three great museum buildings in Texas: the Menil Collection and Cy Twombly Gallery in Houston, and the Nasher Sculpture Center in Dallas. Piano brings impressive experience and credentials to the undertaking, and the museums he has built in various parts of the world are celebrated for their deft handling of forms and materials, expressive use of natural light, and sensitivity to their surroundings. His best-known early project is the Centre Georges Pompidou in Paris, known popularly as the Beaubourg, which he designed with Richard Rogers. In Europe, he is also celebrated for such later projects as the Beyeler Museum in Basel and the Klee Museum in nearby Bern; in the United States, for the recently opened California Academy of Sciences in San Francisco. Other notable commissions include the expansions of the Art Institute of Chicago, the High Museum of Art in Atlanta, and the Morgan Library & Museum in New York.